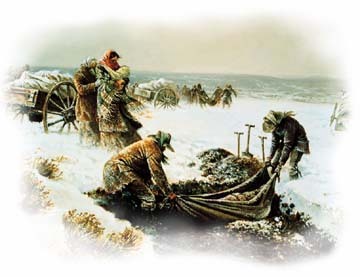 We talk much of the sacrifices of the handcart pioneers, focusing particularly on the faithfulness in times of tragedy that the Willie and Martin handcart companies experienced. Our youth go on handcart treks, stories of the companies come up in sacrament meetings and General Conference on a fairly often and literature and cinema depict their stories—perhaps most notably 17 Miracles and Gerald Lund’s Fire of the Covenant. Because of the drama associated with the handcart story, they have often overshadowed the larger picture of the pioneer era. In addition, other myths have crept into the story. My purpose today is to look at myths and ideas surrounding the handcart companies and evaluate them. The pioneer period of the Church of Jesus Christ of Latter-day Saints began in 1846 with the Nauvoo exodus and went until 1869 when the Transcontinental Railroad was complete. The handcart period was a subset in the middle of this larger group with ten companies traveling during the years 1856 to 1860. While we may go on handcart treks where they have a “Mormon Battalion experience” or “women’s pull”—when the young men step away from the carts and the women pull the handcarts alone for a while (usually up a hill)—the handcart companies and the Mormon Battalion were separated by a decade. When the first handcart companies were organized in 1856, around forty thousand settlers had already come through and settled in the Utah area. All told, handcart companies only account for four to ten percent of all pioneer migration. The handcart period was a subset of the larger pioneer era with companies traveling during the years 1856 to 1860. Church leaders therefore sought a way to cut the costs of immigration. Brigham Young wrote to Franklin D. Richards, the European mission president, in September 1855: ‘We cannot afford to purchase wagons and teams as in times past, I am consequently thrown back upon my old plan—to make hand-carts, and let the emigration foot it, and draw upon them the necessary supplies, having a cow or two for every ten. They can come just as quick, if not quicker, and much cheaper—can start earlier and escape the prevailing sickness which annually lays so many of our brethren in the dust.’ A general epistle by the First Presidency giving detailed instructions on handcart travel was read at the October 1855 general conference but was not acted upon until 1856. It was estimated that using handcarts would reduce emigration costs by a third to a half for each person. Consequently many more people could come to Zion through the available PEF funds. All in all, the handcarts were a success. Three companies made it earlier in the same year the Willie and Martin handcart companies travelled with relatively few difficulties. Included in the first of these companies was John Rowe Moyle of Only a Stonecutter fame. After the Willie and Martin companies, five more handcart companies came to Utah over the course of four years without undue hardships. These seven other handcart companies came across with a comparable number of deaths to wagon trains, but arrived faster and cheaper (though perhaps not as much as President Young predicted). Admittedly, handcarts were never popular (especially after the Willie and Martin companies) and were more exacting than other methods of traveling west. So, after 1860, the Church switched to a different method of bringing immigrants to the Mountain West—the down-and-back companies. The idea for down-and-back companies was that wagon companies would start out with goods in Salt Lake City, go east to the Missouri River and sell their goods, pick up the saints seeking to go west and go back to Utah. Although the handcart companies were largely successful, a more effective way had been discovered. 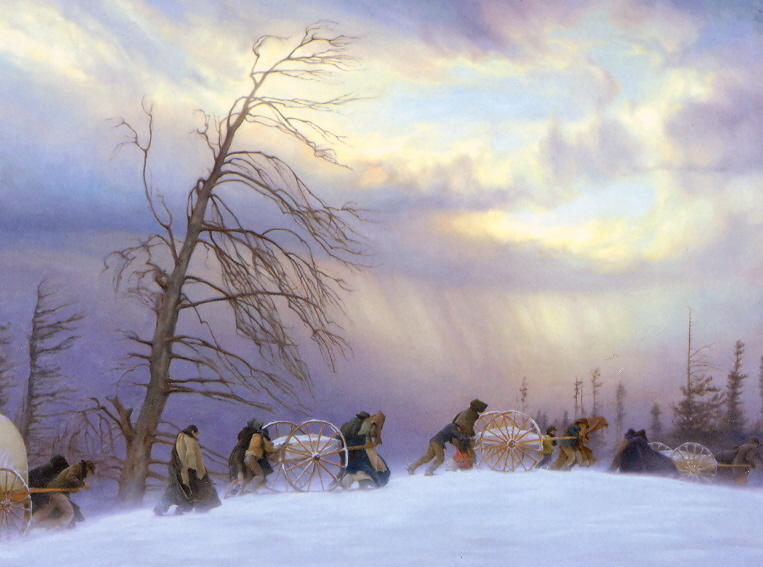 Returning to the handcart era, even while the handcarts were travelling, wagon trains were used. Of the eight thousand Saints who arrived between 1856 and 1860, just under three thousand traveled in handcart companies. In the case of the Willie and Martin handcart companies, they weren’t the only immigrant companies traveling at that time that were in need of rescue—the Hunt and Hodgett wagon trains were also stranded on the trail and were aided by the rescue companies. Though we speak most of the handcart companies’ experiences, there were wagon trains out there suffering through the same fate. Interestingly, at first the Willie and Martin handcart companies weren’t spoken of too often. In the 1800s, they weren’t viewed in the light of amazing sacrifice and dedication to the gospel as they are today. Instead, their experience was viewed as a disaster and a failure and rarely was referenced for almost forty years. Remember that the story of the man stating that “the price we paid to become acquainted with God was a privilege to pay and I am thankful that I was privileged to come in the Martin Handcart Company” was prompted by someone seeking to criticize the Church over the incident. Yet, over time, things have changed, and the incident has become an important symbol to the Church—so much so that it has become the primary story of the pioneers we hear about. So, while we hear a lot about the handcart companies, they were only a fraction of the pioneer movement. It was an idea put in practice about ten years after the saints had started moving to Utah to save money and time, but was eventually discontinued when a more efficient method was put in practice. Even while the handcart companies were coming west, there were still some companies coming by wagon train. Even though the handcart companies are an important symbol to the Church, they were but a small part of the larger pioneer era. 20-25% of the Willie and Martin handcart companies died on the trail. This is abnormally high compared to the average death rate of less than 3%. When we talk about the pioneers, invariably we talk about the deaths they suffered. In a high school English class, we read Mary Shelly’s Frankenstein—which was a bit different than the Frankenstein most people are used to. Our teacher joked that Shelly originally planned for the ending to be: “everybody died!” Then, pausing, Shelley came to the realization: “Wait… who tells the story then? Okay, one of the characters tells some random captain the story and then everybody important dies.” Concerning the pioneers, one almost senses that there is a feeling that everybody died on the way over, especially in the Willie and Martin handcart companies. It is true that “over two hundred members of the two ill-fated handcart companies died before they could reach Zion” and that “more people died in these two companies than in any other immigrant group in the United States,” but most of them did survive. It wasn’t like the Scott voyage to the South Pole where they found the dead bodies and their journals tell the story of their journey—the people themselves passed it on. The Willie Company started with 404 people and about 80 died in that company by the time the rescue parties arrived. The Martin Company started with somewhere between 575 and 625 people and over 100 died in their company before the rescue. In addition to death, the companies were reduced by people dropping out along the way—people who also survived, but decided they didn’t want to push forward. Overall, the rate of death would have been between 20-25% of the initial companies. These are abnormally and tragically high rates of death, but the majority did survive. A friend once attended a fireside where T.C. Christensen spoke. When speaking about 17 Miracles he asked those who were descendants of the Willie and Martin handcart company pioneers to stand up. He shared that he asks that often nowadays and is always stunned by how many do stand—usually about a quarter of those present. He’s done it all over Utah and Idaho, even in a few congregations in California with similar results. While probably not entirely accurate, this goes to show that there were many survivors from these companies who passed their legacy on. Contrary to myth and popular belief, this 1847 trek of approximately 1,032 miles and 111 days was not one long and unending trail of tears or a trial by fire. It was actually a great adventure. Over the decades, Mormons have emphasized the tragedies of the trail, and tragedies there were, but generally after 1847. Between 1847 and the building of the railroad in 1869, at least 6,000 died along the trail from exhaustion, exposure, disease, and lack of food. Few were killed by Indians. To the vast majority, however, the experience was positive—a difficult and rewarding struggle. It should be noted that trials did exist and the trek west wasn’t a cakewalk, especially for the handcart companies–traveling though deep sands, climbing rough mountain passes and dealing with limited supplies while walking for months on end were challenges that were difficult to deal with. For city folk from Europe–such as many of those among the handcart companies–the learning curve of traveling in the frontier of America was immense. My point, however, is that not as many people died as we are apt to think and that there were good experiences to be had on the trail as well. It was in an adult Sunday School class of over fifty men and women. Nathan T. Porter was the teacher and the subject under discussion was the ill-fated handcart company [Martin Handcart Company] that suffered so terribly in the snow of 1856. Some sharp criticism of the Church and its leader was being indulged in for permitting any company of converts to venture across the plains with no more supplies or protection than a handcart caravan afforded. One old man in the corner sat silent and listened as long as he could stand it, then he arose and said things that no person who heard him will ever forget. His face was white with emotion, yet he spoke calmly, deliberately, but with great earnestness and sincerity. He said in substance, “I ask you to stop this criticism. You are discussing a matter you know nothing about. Cold historic facts mean nothing here, for they give no proper interpretation of the questions involved. Mistake to send the Handcart Company out so late in the season? Yes! But I was in that company and my wife was in it, and Sister Nellie Unthank whom you have cited here was there, too. We suffered beyond anything you can imagine and many died of exposure and starvation, but did you ever hear a survivor of that company utter a word of criticism? Every one of us came through with the absolute knowledge that God lives for we became acquainted with Him in our extremities! This is a well-beloved statement of the experiences that the handcart companies went through. When one sits down to study the life of Francis Webster, the story gains even deeper meaning and power. I do not intent to write more of that story now (for further reading on the subject, click here), but to look at a myth that has been spun off from the quote: that everyone who was in the Martin handcart company remained faithful. As I’ve studied the pioneers, I’ve discovered that there were truly those whose faith grew with every footstep they took, and Francis Webster is one of the great examples of that. There were also those whose faith diminished with every footstep that they took. But there were also those on the journey whose faith pushed them ahead, but they ended the journey with basically the same amount of faith that they started with…. The phrase in there that no one in the company ever left, you know, no one ever left the company—that’s just not historically accurate. Why was that the case? As a general rule, what is true now was true then. People tend to get out of an experience what they put into it…. The evidence is clear that not everyone came through the experience with the same certainty that he did. While it is not known that anyone in the company apostatized directly as a result of the trials they endured in the cold and snow, there were Martin Company members who subsequently left the Church. Francis Webster was unlikely to have known everyone in the company and even less likely to have kept track of them all as they scattered all across the American West. He more likely had been pointing to stalwart individuals in Cedar City who lived faithful lives after surviving the Martin company experience—Nellie Purcell Unthank, the Middletons, etc. We really don’t know exactly what he said or meant, but we do know that not everyone from the company remained faithful. When I began my research for writing the script, I made a point of talking to several Latter-day Saint historians. The first advice they gave me was, “Don’t fall into the Sweetwater trap.” I said, “Okay, what’s the Sweetwater trap?” They wouldn’t tell me. They just said to get into the research and I would figure it out. I did figure it out. They were warning me that some of the stories we have heard for many years regarding the incident of rescuer boys carrying others across the Sweetwater are incomplete and therefore reflect some historical inaccuracies. Chad M. Orton wrote about this event in a paper for BYU Studies, from which I learned a great deal. There were other tough, cold, river crossings, and I wanted to make sure to include on in the film. I decided to make it the last crossing of the North Platte, which the Martin company undertook on October 19. My purpose in this section is to discuss some of those historical inaccuracies. This article has been quoted over and over in sacrament meeting, general conference, and other Church settings. As T.C. Christensen learned, however, “some of the stories we have heard for many years regarding the incident of rescuer boys carrying others across the Sweetwater are incomplete and therefore reflect some historical inaccuracies.” This is one of those stories that have inaccuracies. Solomon F. Kimball was the nine year old brother of one of the rescuers during 1856. He did not have the same access to historical records we have today and many of the ones he did were also flawed. He played a huge role in moving the story of the Willie and Martin handcart companies and the rescue efforts into the vision we have of them today, but we need to look at the accuracy of his statement. The evidence indicates that more than three rescuers braved the icy water that day. Of those positively identified as being involved in the Sweetwater crossing, none were exactly eighteen. Although these rescuers helped a great many of the handcart pioneers across the river, they carried only a portion of the company across. While some of these rescuers complained of health problems that resulted from the experience, most lived long and active lives that terminated in deaths that cannot be definitively attributed to their exposure to the icy water that day…. …Brigham Young did publicly associate exaltation with the effort to rescue the stranded pioneer companies, as did Heber C. Kimball, who publicly praised by name two who helped at the Sweetwater. However, both Young and Kimball taught that the tie between the rescue and the celestial kingdom was conditional in that the individuals involved needed to meet established requirements that all Latter-day Saints must attain of living their religion and enduring to the end. Individuals should not be misled to believe that one heroic act on their part will guarantee exaltation in the celestial kingdom. Of the rescuers mentioned by Jones [in a different account of the crossing], eighteen have been positively identified as assisting the Martin Company on the day they crossed the Sweetwater, November 4, 1856: Thomas Alexander, William Broomhead, Robert Burton, Harvey Cluff, Charles Decker, George D. Grant, George W. Grant, Benjamin Hampton, C. Allen Huntington, Daniel W. Jones, David P. Kimball, Ira Nebeker, Joel Parrish, Edward Peck, Thomas Ricks, Stephen Taylor, Chauncey Webb, and Cyrus Wheelock. Of these eighteen, five have been mentioned by name as having helped carry members of the Martin Company across the river: C. Allen Huntington, George W. Grant, David P. Kimball, Stephen Taylor, and Ira Nebeker. Concerning the overall rescue effort, Daniel W. Jones recorded in his autobiography that: “We did all we possibly could to help and cheer the people. Some writers have endeavored to make individual heroes of some of our company. I have no remembrance of any one shirking his duty. Each and everyone did all they possibly could and justice would give to each his due credit.” Though we speak of the three young men who helped the companies across, historical records actually indicate there were at least five while many others helped the company in other ways. While the number of Sweetwater crossing rescuers is uncertain, the ages of those mentioned by name is more certain. C. Allen Huntington, born December 6, 1831, was twenty-four and was the oldest of those named. Stephen Taylor, whose date of birth is December 25, 1835, was twenty. Ira Nebeker and David P. Kimball were both seventeen, their birthdays being June 23 and August 23 , 1839, respectively. George W. Grant, the youngest of the group, born December 12, 1839, was only sixteen years old. Exactly how many members of the Martin Company were physically carried across by the relief party is not known, but the evidence suggests that only a portion of the company crossed in that manner. Several factors argue against the idea that a few rescuers carried all the company over the Sweetwater. First, there likely was not enough time. The company did not reach the river until the afternoon, thus giving them only hours to cross before darkness overtook them. Second, the relief party had access to a number of wagons, which were used to ferry many emigrants across. Third, both rescuers and handcart pioneers recounted that some company members waded through the water themselves…. The elderly also had claim on this service. While many were carried across by the young rescuers or in wagons, those who were able to cross on their own—particularly grown men—were expected to do so. Three of the five boys we know by name that carried people across the river. C. Allen Huntington George D. Grant are the missing ones. George W. Grant suffered and was reportedly “made an invalid for life,” but “Grant’s reported health problems were not enough, however, to keep him from serving a four-year mission in England beginning in 1861, five years after the rescue.” He passed away “in August 1872, at age thirty-two and nearly sixteen years after the Sweetwater rescue”, the first to die of the group. The cause of death was tuberculosis, a common death in the 1800’s. “The next to die was David Kimball, his death occurring on November 22 , 1883, at the age of forty-four. In the intervening years he, too, seemed to live an active life.” C. Allen Huntington died a few weeks shy of his sixty-fifth birthday in 1896, having had several run-ins with the law during his lifetime and ended up working at a ferry in Southern Utah until the time of his death. Ira Nebeker died April, 1905 at the same age Huntington was when he died. His death was from a form of kidney failure. Reportedly, his health was sapped away by the effects of the crossing, but he still managed to support himself as a stockman and a farmer, settling the town of Lakeshore where he also served a bishop for many years. The final member of the rescuers mentioned at the crossing was Stephen W. Taylor, who died in 1920 at age eighty-four. 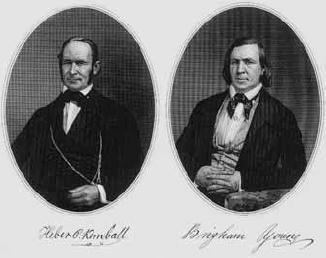 What did President Brigham Young and Heber C. Kimball promise the rescuers? 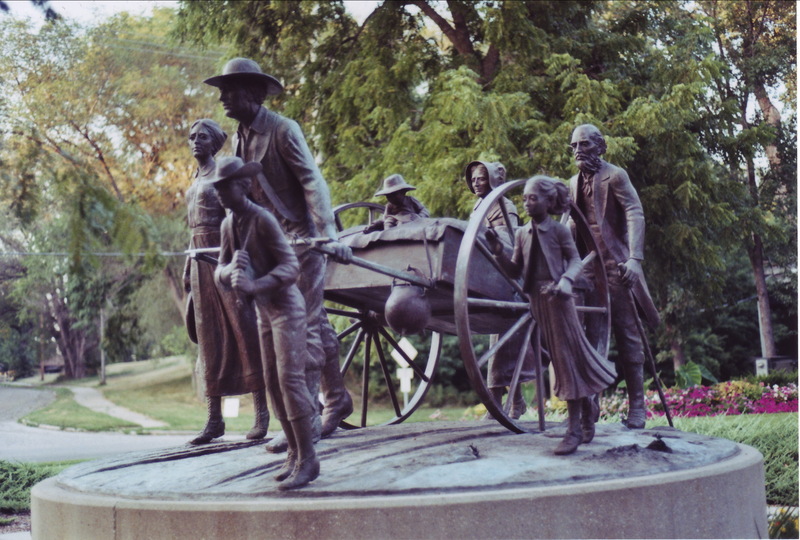 After everyone was in the valley, Heber C. Kimball stated: “God bless those men who went to the rescue of our late immigration, and all who have in anywise assisted it; also those who have come in this season, if they live their religion and appreciate their blessings.” Later on, President Young also taught “He that endures to the end the same shall be saved. Not to run for a season and then turn away; but those who endure to the end will receive a fulness of joy.” It seems clear that one act alone could not guarantee salvation, but that individuals had to endure to the end. It is also interesting to note that Solomon Kimball wrote another account about six years earlier than the famous one in which the promise was slightly different: “When President Brigham Young heard of this heroic act, he wept like a child, and declared that this act alone would immortalize them.” With this in view, we can, perhaps, get a different view of what President Young was promising them. First, that if they continued on the path they were on they would gain exaltation. Second, their act of sacrifice and bravery would cause them to be immortalized in the minds of the people—something that has definitely come true. Concerning the Sweetwater Crossing, Orton wrote in his conclusion: “the Sweetwater crossing needs to be understood in perspective. It is not the rescue story, but a story of the rescue effort. While the story of the rescue extends far beyond the crossing, that aspect has taken on a life of its own in part because of how it has been romanticized and in part because it also fills a human need to attach names and faces to events.” It was only one event with one company in almost two months of rescue effort for four companies. We do not need to underestimate how amazing it was, but we likewise should not underestimate the magnitude of the rest of the rescue effort. After the Martin Company had given up in despair, after all hopes had vanished, after every apparent avenue of escape seemed closed, at least five boys ranging from ages sixteen to twenty four belonging to the relief party came to the rescue, and to the astonishment of all who saw, carried many members of the unfortunate handcart company across the snowbound stream. They suffered from the effects of the exposure, but were eager to serve their fellow-men and follow the command of their prophet. 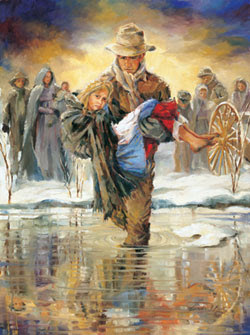 When President Brigham Young heard of this heroic act, he wept like a child, and later declared, that act will immortalize them forever and grant them salvation in the kingdom of God if they continue faithful. It could be said, just as with the Sweetwater rescue, that the handcart story is not the pioneer story, but a story of the pioneer era. We need to keep it in perspective. Most pioneers (90-96%) were not handcart pioneers. It wasn’t all about death, tears, and heartache—for many, the journey was one of adventure, or just walking forever to get to Zion. While there were many who grew in their faith from the trials of the tragedy the Martin and Willie handcart companies went through, there were those who lost faith as well. Finally, there was more to their story than just crossing the Sweetwater River with help. So, when you celebrate Pioneer Day or any other time of remembrance, remember to celebrate and honor all pioneers of the faith. Chad M. Orton, “The Martin Handcart Company at the Sweetwater: Another Look,” BYU Studies 45, no. 3 : 8-9; available online at byustudies.byu.edu. Rogerson, “Martin’s Handcart Company, 1856,” 8. Thank you for your comment and interest, Tim. I’m glad to hear that it will be of use to you in a Gospel Doctrine lesson. Your point is taken and I have edited that section a little to reflect that (further editing will be done to the post in general in a few months when I have more time). Also, the quote that I referred to from the National Parks historic guide that says the 1847 trek was “actually a great adventure” is probably somewhat accurate for the 1847 vanguard brigade, since it was around 140 men and a few women who were specifically chosen to blaze the trail west. They had their difficulties, but they were more prepared for the trip than we would be today or many of the later immigrants were. I did, however miss the fact that the quote was directed at that one specific company until today, which is now reflected in the text above. Again, thank you for pointing out that mistake to me. Thank you for this!!! I just did a trek over this past weekend. I enjoyed the glimpse into the pioneer endeavor, however I wonder why we choose to “celebrate” the hardship of two companies rather than understand that most others came pretty much without incident. I am proud to be of pioneer heritage and I do not want to diminish their willingness to dive forward into this trial of faith, but I hate that it seems to be the only stories that get told. It also drives me crazy that they take the men 12 and older and do the womens pull. It just didn’t happen like that but no one ever clarifies that fact. Most people think it did!!! Heck, I didn’t know until last year that all handcart companies didn’t face this same hardship, frightening since I am 42 years old!!! Thanks again I wish more people would read this, understand the truths and feel the stories to deepen our own faith and gratitude!!! Thank you, Tammie. I’m glad you enjoyed this post. I agree with Tammie. I trekked with her last week. Thank you for putting into perspective our heritage. Your explanation is more similar to the one I was taught in all of my growing up years. 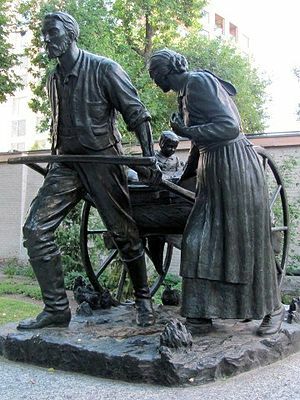 I love to be able to honor the pioneers and the sacrifices they made without the feeling of horror that haunts me when I focus only on the tragedies of the Willie and Martin Handcart Companies. It also allows me to feel proud of my ancestors who crossed the plains “without incident.” Thank you for bringing back to me the joy of my pioneer heritage.